Although my son isn’t quite ready to start sending Valentine cards, I love the excuse to play with all things red and hearts! 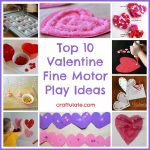 Here’s our Valentines fine motor activity. First I added a little red food dye to the water beads and let them “stew” for a while. Then we were ready to play! F loved the clear tongs, and decided to transfer the water beads into the bucket. There was something rather appealing about being able to see the water beads in the “spoons” of the tongs. He decided some of the gems should go into the vase. But then changed his mind and transferred them into the bucket. He played this way for some time, but once he had got all the gems and beads into the bucket he tried to pour them all into one of the white bowls, spilling contents all over the place! Because of the food dye, unfortunately this made quite a bit of a mess, at which point he decided he’d had enough! But it was fun while it lasted! So what has everyone else been up to this week? 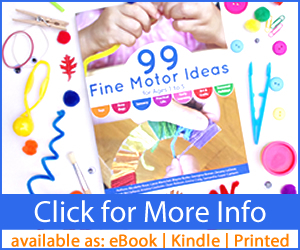 Check out the rest of the Fine Motor Friday posts! I love the heart gems and the vase – will have to keep an eye out next time we visit the dollar store! Good idea to use clear tongs so he could see what he was grasping! Looks like he is pretty skilled with those tongs! 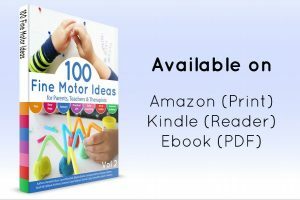 I know a 3 year old who would enjoy this too! This looks like fun! I have got to get to the dollar store & get us some new supplies! I love the addition of water beads! They are so irresistible! What a fab invitation to play. I love the heart vase, dollar stores are soooo great for fun and of course highly classy 😉 , stuff for kids!